From left, Arch Ferrell, Russell County circuit solicitor; Si Garrett, Alabama Attorney General; and Ralph Mathews, Russell County sheriff. 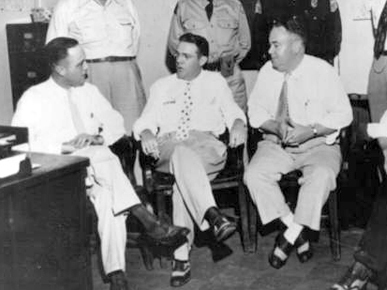 The three were initially implicated in the June 1954 murder of Garrett's opponent for attorney general, Albert Patterson. Mathews was convicted on 10 counts of neglect of duty. Ferrell was acquitted of involvement in Patterson's murder, and charges were never brought against Garrett.